A report based on experience from a databank of 10,000 eyes. For decades, we have been “fitting” soft lenses based on central k readings. We add a certain value based on a fitting guide to arrive at the ‘best’ BCR. Then we order the lens and hope for the best. So based on an area of measurement of 3 mm, we determine the design of a soft lens that covers at least 14 mm of the anterior eye. Or perhaps a more common scenario: We pick a “one size fits all” diagnostic lens from a blister pack and put it on the eye. If the “push-up” test shows any movement, we grade the fit to be okay. This is, in fact, a very unsatisfactory way of fitting lenses if you compare it with, for instance, RGP fitting. With RGP fitting, based on topography and with the help of sophisticated fitting software and simulated fluorescein patterns, we are able to determine the ideal lens parameters for the perfect fit. Our dilemma in soft lens fitting is, of course, that the fitting characteristics of soft lenses are determined beyond the cornea - i.e., over the limbus and on the sclera. Placido-based topographers provide a best-case-scenario area of coverage of between 9.6 to 10 mm: not anywhere near the area where the soft lens ‘lands.’ But is this a problem? Not everybody is convinced of this: it could be argued that a soft lens is flexible and follows the shape of the eye. This is, however, far from the truth. From our investigation and experiments, and from various publications, we do know that about 20% of eyes would be better off with a well-fitted, tailor-made soft lens. Figures 1a and 1b illustrate which group would be better off with custom-made soft lenses and which group can be fitted with “one size fits all” lenses. This information is based on our databank of 10,000 eyes. Figure 1a: application area of eyes in our database for a disposable lens BCR 8.60 Diam 14.2 versus tailor made lens (horizontal axis sagittal height, vertical axis percentage). But how do you determine whether an eye can be fitted with a standard frequent replacement lens or whether it needs a custom lens? The new soft lens fitting module developed by Procornea in the Netherlands provides an answer to that question. 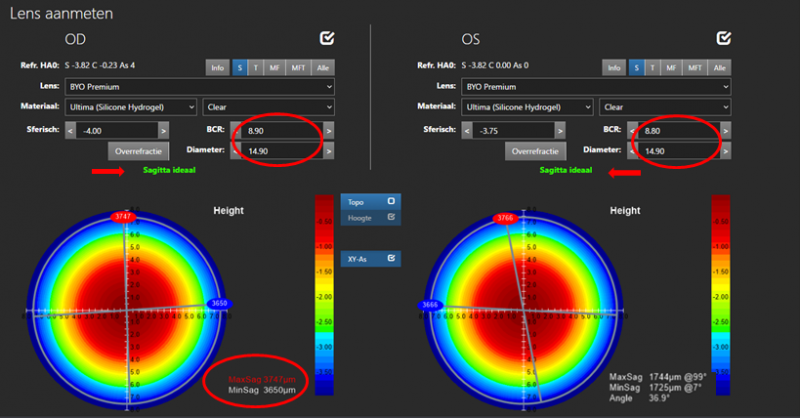 After importing the corneal topographies into the lens fitting software, the software will calculate height maps for the area that the soft lens will cover (based on corneal diameter). Dedicated algorithms calculate the sagittal height of the eye for the cord diameter of the proposed soft lens up to 15 mm. For every chosen diameter, the software will calculate the BCR for the optimal sagittal height of the lens to order. The following example explains how this works in clinical practice. A 31-year-old female patient has worn soft lenses for six months. At her six-month routine eye check, the patient complained about discomfort after 7 to 8 hours of contact lens wear. She also noticed decreased vision with her glasses after lens removal (spectacle blur). The VA was slightly decreased compared to the initial values. Lens fit ODS: Push-up test: Hardly any movement, tight periphery especially on the nasal side (see figure 2). Figure 2: The initial lens fit (OD) with hardly any movement upon push-up test, tight periphery especially nasally. Corneal topography was performed immediately after removing the contact lenses from the eyes, and this was compared with the initial topography measurement (see fig 3). Figure 3: corneal topography (OD) before (left) and after (right) 8 hours of lens wear, showing corneal warpage after lens wear. Topography maps ODS show corneal warpage visible after 8 hours of soft lens wear, which explains the spectacle blur. We imported the initial topography, subjective refraction and corneal diameter in the lens module software and started the soft lens (sag fit) module. The software immediately calculates the best lens to choose based on height data. In this patient, the software indicated that based on the relatively low sagittal height of both eyes, tailor-made lenses should be fit instead of standard frequent replacement options. 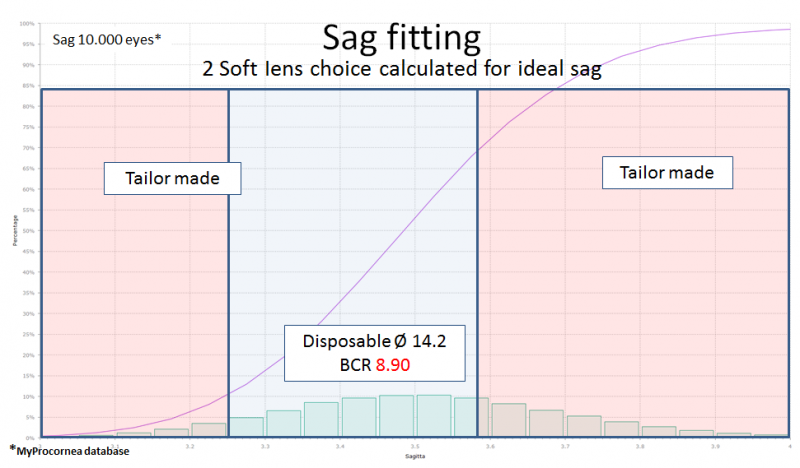 You can see that the lenses are calculated for BCR and diameter in 0.10 mm steps to reach the optimal sag for each eye (figure 4). Figure 4: the lenses are calculated for BCR and diameter in 0.10 mm steps to reach the optimal sag for each eye. The height maps show the minimum and maximum sag for both eyes at a chord length up to 15 mm in the two principal meridians. In this case, we are dealing with relatively low sagittal height compared to normal, which explains the tight fit of this patient’s frequent replacement lenses that are designed to fit the “normal” eye. We ordered the tailor-made soft lenses for this patient, and she has been a happy soft lens wearer for 6 months now. At a recent contact lens check-up, the lenses exhibited a perfect fit in both eyes, with optimal movement and centration (Fig 5). Standard frequent replacement lenses are designed for the “normal” eye in terms of sagittal height. This will be perfect for the majority of patients. In this patient, we were dealing with a relatively low sagittal height, which was why the standard lenses were unsuitable and caused comfort problems. 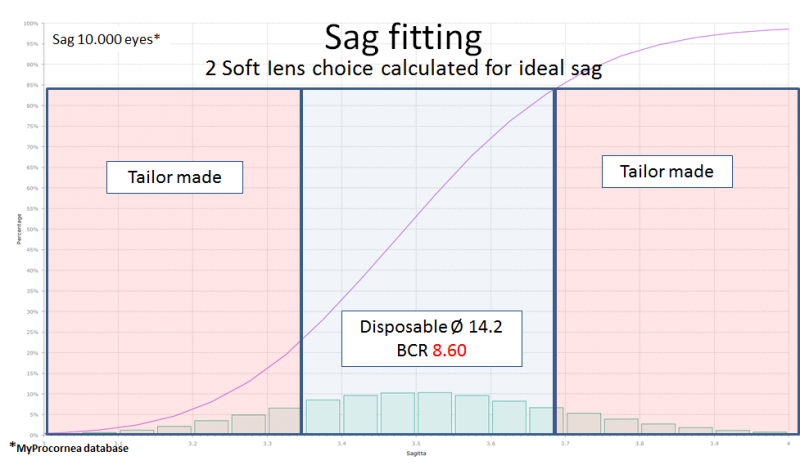 With the new sag fit module, we are able to make the right choice in soft lens geometry for each patient. This often will be frequent replacement lenses, but when needed we can calculate an optimal tailor-made lens. Elien Janssen graduated as an optometrist from Hogeschool in Utrecht, and started her career working in high level eye care clinics and specialty contact lens practices. 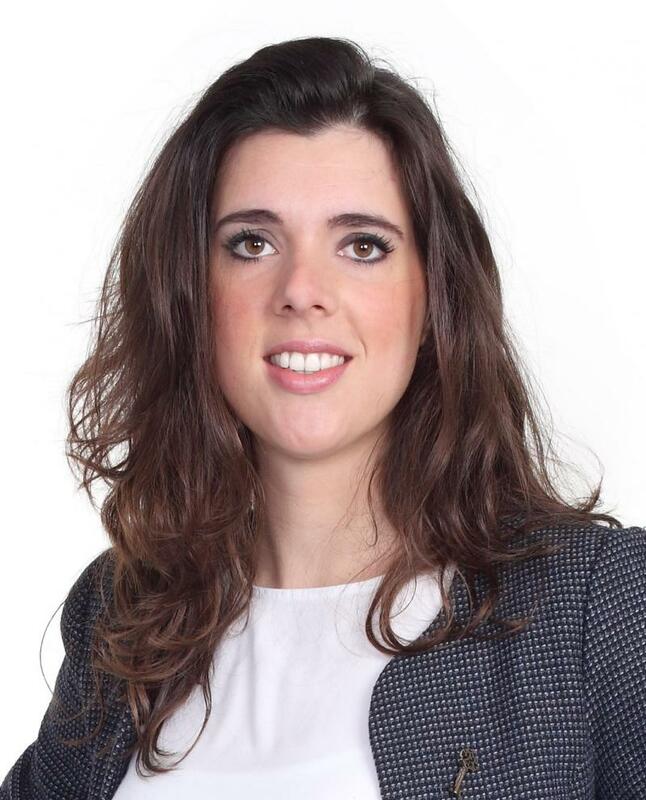 Elien joined Procornea in Eerbeek, The Netherlands, as Professional Service Manager, and provides trouble-shooting, training, education and product development, and acts as the primary consultant for scleral lenses. She is a board member of the Podium Cornea and Contact Lenses and the Dutch Contact Lens Practitioners Association (ANVC). Furthermore she is a committee member of the Netherlands Contact Lens Congress (NCC). Ron Beerten started his career in 1983 in the Dutch Naval contact lens clinics, soon becoming involved in a range of contact lens-related studies on behalf of the Dutch armed services. In 1986, he joined a group of hospitals in the Netherlands specialising in contact lenses and low vision. In 1988, Ron joined Visser Contact Lens Practice in Nijmegen. During this time, he became involved in FDA studies and clinical trials for the contact lens industry. 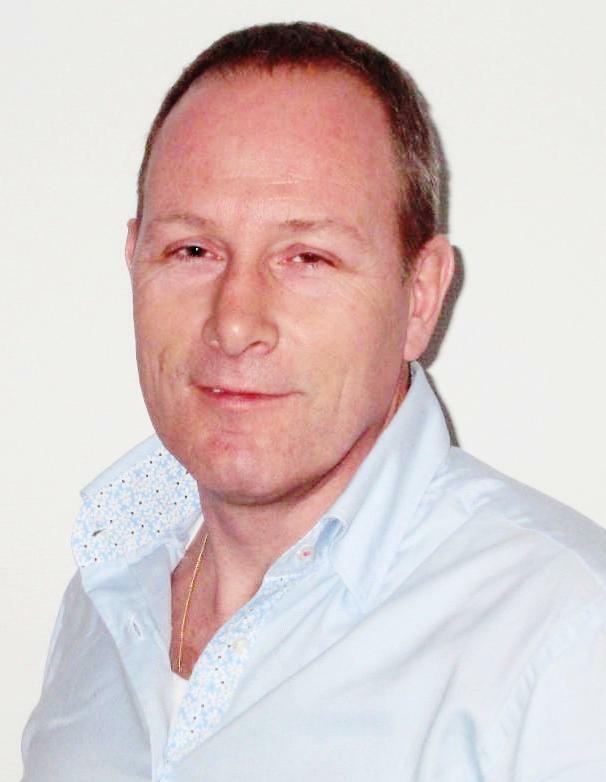 Ron joined Procornea Contact Lens Laboratory in Eerbeek as Professional Service Manager in 1996. He plays a key role in product development and is still in clinical practice one day a week. In recent years, Ron has lectured throughout Europe and Asia, delivering contact lens training seminars and lectures on various topics including topography, orthokeratology, and RGP and scleral lens fitting and is involved in a number of myopia control projects.